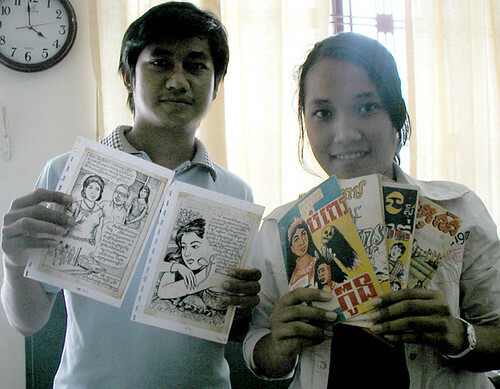 And graphic designer Channa is holding comics lent to Our Books from a generous private collector. These comics are mainly from the 1980s era and even reprint some pre-revolutionary stories! We have about 150 stories to scan, digitally clean and sort for archiving. For those of you who have difficulty remembering our web address www.siewphewyeung.org.kh , we’ve recently added ‘redirects’ www.ourbookscambodia.org and www.noslivrescambodge.org to make getting in touch a little easier – whether you speak French, Khmer or English!